The history of Yiddish publishing has been marked by complexities and enormous challenges. Yiddish authors and publishers have faced government censorship, political upheaval, diaspora and a geographically fragmented market, weak educational institutions, the temptations of assimilation, state-sponsored repression, and the overwhelming catastrophe of World War II. Nevertheless, some things did go right: Yiddish-speaking Jews were readers. They were by and large an urban (or urbanizing) population. And their geographical dispersion eventually helped make Yiddish book publishing a viable worldwide enterprise. Like reading audiences everywhere, late nineteenth-century Yiddish readers devoured the popular literature of the time, and at that time it was shund (“trash”), to use the epithet employed by writers and editors seeking to establish a higher tone for Yiddish literature. Shund sold like hotcakes, however, and together with religious texts, it underpinned commercial publishing enterprises such as Joseph Werbelowsky’s Hebrew Publishing Company in New York City or Jacob Lidski’s publishing business in Warsaw. The same publishers that cranked out the popular Yiddish literature and sheet music that readers so eagerly consumed also marketed holy day prayer books (sidurim and makhzoyrim), the Torah, and haftoyres. Historically, Yiddish book publishing has been small in scale and woefully undercapitalized. But there are a few exceptional cases of influential publishing houses, successful entrepreneurs, and formidable editors. Jewish settlement in big cities also created a base for mass-circulation newspapers that both educated readers and accommodated their tastes. Yiddish authors who could eke out a living from their writing could do so only because of the pay they received for stories and novels serialized in the daily or weekly press; a lucky few saw their work repackaged as books. Abraham Cahan, the longtime editor of the Forverts (Jewish Daily Forward), in New York City, served as both a cultural authority and—directly or indirectly—a book publisher. Few Yiddish publishing houses resembled the great enterprises of the United States, Great Britain, France, Germany, or Russia—companies that employed legions of editors, clerks, and salesmen. (Boris Kletskin’s company in Vilna was an outstanding exception, representing the apex of the higher-end Yiddish book trade from the 1910s through the 1930s.) Yiddish book publishing in Soviet Russia, for example, stood in dramatic contrast to the “petit bourgeois hucksterism” (as the Soviets viewed it) of the mass-market press in the West. State-sponsored publishing houses such as Der Emes, in Moscow, predominated. Soviet publishers churned out works of Yiddish fiction, poetry, and scholarship on a grand scale, along with children’s books and political propaganda. During the 1920s and early 1930s, the Soviet Union was the locus of Yiddish book publishing, at least in terms of output: Jewish Publications in the Soviet Union, 1917–1960 lists approximately 3,500 Yiddish books produced during that period (excluding translations into Yiddish). Government sponsorship was risky, however, especially in the repressive atmosphere of Joseph Stalin’s U.S.S.R. With the stroke of a pen, an entire enterprise could be shut down and its editorial staff and authors deported to Siberian labor camps—or worse. Yiddish publishing revived somewhat in the Soviet Union during the Cold War under the watchful eye of the poet and cultural commissar Arn Vergelis, editor of the journal Sovetish heymland (Soviet Homeland). To a degree that is probably underestimated today, the immediate postwar decades—roughly 1945 to 1970—represented a silver age for Yiddish literature, notwithstanding the tremendous attrition in the ranks of readers and authors. New publishing centers arose, most notably Buenos Aires and Tel Aviv, and enterprising editors came to the fore, such as Mark Turkow and Avrom Sutzkever. New business models emerged as well: the support of the mutual aid societies (landsmanshaftn) of Polish Jews in Argentina, for example, enabled Turkow to launch the important book series Dos poylishe yidntum (Polish Jewry). The peerless literary journal Di goldene keyt (The Golden Chain), edited by Sutzkever, was subsidized (improbably as it might seem, in view of the Israeli political establishment’s outspoken antipathy toward Yiddish) by the Israeli labor confederation Histadrut; the journal stood at the center of Yiddish book publishing in Israel. Historically, Yiddish book publishing has been small in scale and woefully undercapitalized. But there are a few exceptional cases of influential publishing houses, successful entrepreneurs, and formidable editors. Here are some of their stories. Clockwise from top left: Arn Vergelis, Avrom Sutzkever, Mark Turkow, Abraham Cahan. Illustrations by Heather Gatley. While it is fairly easy to trace the careers of Yiddish editors, the same cannot be said about commercial publishers such as Joseph Werbelowsky and Jacob Lidski, small businessmen whose accomplishments are not very well documented. Brief obituaries for Werbelowsky mention that he immigrated to the United States from Lithuania in 1884 and died in Brooklyn in June 1919 at age 65. Werbelowsky was a pillar of the Beth Hamedrosh Hagodel, on Moore Street in Brooklyn’s Bushwick district, and he also dabbled in Brooklyn real estate. He worked as a bookseller and dilettante publisher for some years before founding the Hebrew Publishing Company in 1900. The company was to have the greatest staying power of any Yiddish book publisher, and for decades it also maintained a busy retail shop on New York City’s Lower East Side. For its fiftieth anniversary, the Hebrew Publishing Company produced a catalog of its publications, “the largest in the world, the oldest in America.” At nearly 200 pages, the catalog boasts an extensive inventory (including prices, as of 1951) of books and booklets in Yiddish, Hebrew, and English, along with sheet music, greeting cards, and religious articles such as kiddush cups and taleysim. The three early Yiddish writers commonly referred to as di klasiker (The Classicists)—Mendele Moykher Sforim, I. L. Peretz, and Sholem Aleichem—are represented by thin chapbooks. Entries for works by once-popular (and now forgotten) Yiddish authors such as Dovid Moyshe Hermalin and Getzel Zelikovitsh sit alongside Yiddish translations of Leo Tolstoy and Jules Verne. Werbelowsky’s Warsaw analogue and competitor was Jacob Lidski, who was born in Slonim (now Belarus) in 1868. According to the Yiddish scholar and journalist Zalmen Reyzen, Lidski’s father was a Torah scribe and bookseller, so it is not altogether surprising that he too entered the book trade. After Russian censorship relaxed somewhat in the wake of the 1905 revolution, the business took off, and demand for Yiddish books grew exponentially. Lidski got his start in book publishing in Chicago in the 1890s. In 1899 he settled in Warsaw and became involved with radical movements of the day, helping to smuggle socialist literature into Tsarist Russia. Around 1900 he established the Progres publishing house, known for its popular scientific books, as well as original literary works and Yiddish translations from world literature. (Dozens of these titles can be found in the Yiddish Book Center’s collections.) After Russian censorship relaxed somewhat in the wake of the 1905 revolution, the business took off, and demand for Yiddish books grew exponentially. Progres was the first to publish books by Sholem Asch and Avrom Reyzen. It also published such notable authors as Hayyim Nahman Bialik, Peretz Hirschbein, I. L. Peretz, Lamed Shapiro, Sholem Aleichem, and I. M. Weissenberg, as well as early editions of Peretz’s and Sholem Aleichem’s collected works. A few Progres publications bear the imprint “Varsha-Nyu-York (Warsaw and New York)”; Lidski had decided to establish a foothold overseas in response to concerns raised by competitors, such as the Hebrew Publishing Company, that his house was violating international copyright. In 1911 Lidski cofounded the “Tsentral (Central)” Yiddish and Hebrew publishing conglomerate in Warsaw. During World War I, under German occupation, he established yet another Yiddish publishing house in Warsaw, Yudish, which produced several dozen editions, many of them translations. He fell ill and died in Vilna in 1921 while overseeing yet another of his business ventures, the takeover of that city’s Rozenkrants un Shriftzetser publishing concern. 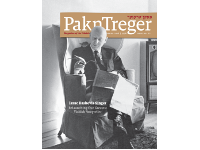 “In his will, he refused to return to the Yiddish writers the type molds of his Farlag Yudish,” Zalmen Reyzen observed. Zalmen’s brother Avrom Reyzen was likely one of the writers affected by that decision. Boris Kletskin was an exceptional figure in Yiddish book publishing, coming from a wealthy and religiously “enlightened” background. Born in 1875 in Horodishche (now Belarus), he was active in the socialist movement of the 1890s through the so-called zhargonishe komitetn (“Jargon” Committees, to use the already antiquated term for Yiddish) that sought to fan the flames of revolution by disseminating Yiddish reading matter to Jewish workers. Later, he supported the Jewish Labor Bund, helping to establish its publishing arm Di velt (The World) before World War I. He founded his own publishing house, Vilner farlag fun B. A. Kletskin, in Vilna around 1910. According to the YIVO Encyclopedia of Jews in Eastern Europe, “Kletskin was one of the first Yiddish publishers to pay authors generous advances and honoraria, and is considered ‘the first genuine publisher of modern Yiddish literature.’” His imprints were distinguished by beautifully designed covers with metal bas-reliefs of their authors. Those writers represented the cream of the crop: Dovid Bergelson, Alter Kacyzne, H. Leivick, and Joseph Opatoshu. Kletskin also released Yiddish translations of Nobel laureates Knut Hamsun, Thomas Mann, Romain Rolland, and Rabindranath Tagore. (Hamsun and Mann were translated by the young Isaac Bashevis Singer.) Kletskin published several pioneering journals, including the children’s magazine Grininke beymelekh (Little Green Trees, 1914–39), Di yidishe velt (The Yiddish World, 1913–15), and the weekly Literarishe bleter (Literary Pages, 1924–39), the most respected Yiddish literary journal of its day. The enormous contributions of the Kletskin-farlag to the emerging Yiddish high culture cannot be overstated. The publishing house fell victim, however, to the sharp decline of Boris Kletskin’s personal fortune during the Great Depression and to his death from heart disease in 1936. Abraham Cahan—yet another Litvak—was a protean figure on the Yiddish- and English-language journalistic, literary, cultural, and political scenes in the United States. Born in Podberezhie (now Belarus) in 1860, Cahan was educated in Vilna. He emigrated to the United States in 1882, fleeing Russian authorities seeking to arrest him for his socialist activism. It was through his long tenure as editor of the Forverts that Cahan put his stamp on Yiddish publishing. For more than half a century, until his death in 1951 at the age of 91, he championed many Yiddish authors, running their poems, stories, and novels in the pages of the Forverts. Like his contemporary Werbelowsky, Cahan belonged to the “Mayflower” cohort of Russian-Jewish immigrants who arrived in America after the assassination of Tsar Alexander II and the ensuing wave of pogroms. Cahan is remembered as the author of two well-regarded novels in English: Yekl: A Tale of the New York Ghetto (on which the film Hester Street is based) and The Rise of David Levinsky. He also served as Hutchins Hapgood’s personal guide to the Lower East Side, enabling that American journalist to pen a series of sensitive and sympathetic sketches for his book The Spirit of the Ghetto. But it was through his long tenure as editor of the Forverts that Cahan put his stamp on Yiddish publishing. For more than half a century, until his death in 1951 at the age of 91, he championed many Yiddish authors, running their poems, stories, and novels in the pages of the Forverts. But for those of whom he disapproved (or who disapproved of him) and with whom he feuded, he was a scourge. These included playwright Jacob Gordin and novelist Sholem Asch (during Asch’s later “Christological” phase), as well as writers associated with the pro-communist Frayhayt newspaper. Because it enjoyed the highest circulation of any Yiddish daily (at its peak it sold close to a quarter million copies each day) and also because it was affiliated with the Socialist Party, Cahan’s Forverts occupied an especially influential position in Yiddish journalism. But the Forverts was also an occasional publisher and distributor of Yiddish books, often selling them to Forverts readers at enticing discounts or offering them as premiums. The Forverts’s book publishing was especially prolific during the 1910s, when it released the collected works of the celebrated “sweatshop poet” Morris Rosenfeld, early fiction by Asch, and the collected works of the French writer Guy de Maupassant (over the years, hundreds of copies of this edition, in its familiar red binding, have been gathered by the Yiddish Book Center), as well as nonfiction works of a socialist or freethinking bent, such as August Bebel’s Di froy un der sotsyalizmus (Woman and Socialism). Forty-two short stories that first appeared in that paper have just been published in translation in Have I Got a Story for You, edited by Ezra Glinter, a reporter with the English-language Forward. In the immediate aftermath of World War II tens of thousands of Holocaust survivors—the sheyres hapleyte—regrouped in Western European displaced persons camps, eventually settling in Israel, North America, Australia, and other countries. A new genre of publication emerged during those years—the community memorial volume, or yizker-bukh, sponsored by the hometown mutual-aid societies (landsmanshaftn) established to support Jewish immigrants in their new countries. In Buenos Aires, an enterprising Polish Jewish immigrant named Mark Turkow launched the most distinguished book-publishing initiative of the postwar decades: the series Dos poylishe yidntum, published by an alliance of landsmanshaftn called the Central Union of Polish Jews in Argentina. Between 1946 and 1966, a total of 175 books appeared in the series, with individual print runs as high as 5,000. The series was especially productive during its first decade; as many as eighteen titles appeared in 1949 alone. The genres included in Dos poylishe yidntum run the gamut from Holocaust-era diaries and testimonies to memoirs about Jewish life and Yiddish culture in Poland before 1939. There were volumes on music, folklore, and historical, sociological, and linguistic scholarship, as well as fiction and poetry. Born in Warsaw in 1904, Turkow belonged to a theatrically connected family: his brothers Zygmunt, Yitskhok, and Jonas were mainstays of the Polish Yiddish stage. Mark Turkow pursued a career as a journalist, at one point serving as co-editor of the Warsaw Yiddish daily newspaper Moment. He emigrated to Argentina in 1939, shortly before the German invasion of Poland. Both before and after the war, Turkow was active in the World Jewish Congress, and in 1959 he was named director of its South American branch. As editorial director of Dos poylishe yidntum, Turkow used the full range of his political, diplomatic, and fundraising talents. It was a propitious moment to launch such an initiative: a sizable community of Yiddish-speaking Jews arrived in Argentina during the 1920s and ’30s, and many of them became prosperous enough to underwrite these publications. Through Dos poylishe yidntum, Turkow put Buenos Aires on the map as a world center of Yiddish book publishing, a position it continued to occupy through the 1970s. The genres included in Dos poylishe yidntum run the gamut from Holocaust-era diaries and testimonies to memoirs about Jewish life and Yiddish culture in Poland before 1939. There were volumes on music, folklore, and historical, sociological, and linguistic scholarship, as well as fiction and poetry. Among the many notable authors whose works appeared in the series were poets Chaim Grade and Rokhl Korn, historian Emanuel Ringelblum, linguist and cultural historian Max Weinreich, and the young Eliezer (Elie) Wiesel, whose Yiddish Holocaust memoir Un di velt hot geshvign (And the World Was Silent) was later rewritten in French as La Nuit (Night). The 1920s and ’30s were the heyday of Yiddish publishing in the Soviet Union, with thousands of books, pamphlets, magazines, and journals appearing in Kiev, Kharkov, Minsk, and Moscow. The purges of the late 1930s took their toll on Soviet Yiddish culture, and what the Soviets called the Great Patriotic War (1941–45) brought about the near annihilation of Jewish life in regions under Nazi occupation. But the war also afforded a modest degree of breathing space to exponents of Yiddish culture, with the Moscow newspaper Eynikayt (Unity, published by the Jewish Anti-Fascist Committee) serving as the quasi-official voice of Soviet Jews until it was shuttered in 1948. Yiddish book publishing ceased completely from that year until 1959, when a collection of stories by Sholem Aleichem, edited by the poet and war veteran Arn Vergelis, was brought out, in large part in response to pressures from abroad. Two years later, the journal Sovetish heymland was launched, with Vergelis as its editor. Scholar Gennady Estraikh has described Vergelis as “the perfect Jewish Homo Sovieticus.” Vergelis was born after the Bolshevik Revolution (1918) in Lyubar, Ukraine. When he was twelve his family relocated to the Soviet Far Eastern district of Birobidzhan, the “Jewish Autonomous Region,” as it was (and still is) officially designated. His earliest poems appeared in a local Yiddish journal, Forpost, and in the Birobidzhaner shtern newspaper. Later Vergelis moved to Moscow, where his first book of poetry came out in 1940. He served as a paratrooper during the war and returned afterward to the Soviet capital, where he briefly resumed his literary career. Unlike many of his fellow Yiddish writers, Vergelis was not imprisoned, exiled, or executed during the “dark years” of 1948 to 1953. Sovetish heymland, the journal he edited from 1961 until 1991, did not publish books per se, but each densely packed issue amounted to a book-length anthology. (Sovetish heymland was a “thick journal,” modeled on Russian-language counterparts such as Novyi mir.) The journal also played a pivotal role as an outlet for the small number of Yiddish writers who published books in Moscow during the last three decades of the Soviet regime. Many of these authors were relatively young, born in the 1910s and 1920s. Vergelis did not stray from Communist Party orthodoxy, and this caused a major breach between him and previously pro-Soviet sympathizers outside of the U.S.S.R., beginning with the Six-Day War in 1967—when the Soviet Union severed diplomatic relations with Israel—and continuing until the advent of perestroika in the late 1980s. A fair number of the journal’s contributors left for Israel during the 1970s, where they resumed their literary careers under vastly different political circumstances. By the 1990s, Yiddish publishing worldwide had dramatically declined. Outside of the Hasidic milieu the handwriting was on the wall in Moscow, New York, Tel Aviv, and Buenos Aires. Nevertheless, when Vergelis died in 1998, he left behind an enduring legacy, thanks to his nurturance of a newer cohort of writers born between the late 1930s and late 1950s. This younger generation was trained in formal courses that Vergelis organized in the 1980s under official Soviet sponsorship. Some eventually assumed prominent positions abroad as Yiddish journalists and editors or as academics specializing in Yiddish studies, including the fiction writer Boris Sandler, who recently retired as editor of the Yiddish Forverts; the literary scholar Mikhail Krutikov, now at the University of Michigan; and Gennady Estraikh, now at New York University. During his lifetime, Avrom Sutzkever’s towering stature as a Yiddish, Jewish, and world poet was widely recognized. Born in 1913 in Smorgon (now in Belarus), he was a member of the pre–World War II literary group Yung Vilne. During the German occupation of Vilna, Sutzkever penned complex and stirring poems, drawing upon his experiences and observations in the Vilna ghetto. Sutzkever was one of the forced laborers charged with sorting through Jewish cultural treasures that were being looted by the Nazis, under the supervision of the ideologist Alfred Rosenberg. The members of the so-called “Paper Brigade” managed to rescue and hide many valuable books and manuscripts that were destined either for an anti-Semitic research institute in Frankfurt am Main or for the rubbish heap. In 1943 Sutzkever escaped from the ghetto and joined the partisans. The following winter he was airlifted to Moscow. Two years later he testified at the Nuremberg war crimes trials. In 1947 he made his way to Tel Aviv, where he remained until his death in 2010. For Sutzkever, Yiddish literature was very much alive, and the journal he edited for forty-six years opened its pages to literary voices, both old and new, from around the world. In the winter of 1949, just after the end of the Israeli war of independence, the first issue of the Yiddish literary journal Di goldene keyt (The Golden Chain) appeared in Tel Aviv, with Sutzkever as its editor. In his preface to the first issue, the Israeli labor leader Joseph Sprinzak wrote, “The Histadrut has deemed it advisable [hot gefunen far neytik] to publish a literary journal in Yiddish.” The most important Yiddish literary publication of the post-Holocaust period was thus established, and it operated under quasi-official auspices, with the knowledge and approval of authorities who were not otherwise known as promoters of Yiddish culture. “The state’s policy-makers,” cultural historian Rachel Rojanski writes, “favoured the creation of a kind of small island of Yiddish culture that would allow it to be preserved, perhaps even developed, like an asset that every nation keeps in its pantheon of culture, as a positive feature of the past, to be preserved, nurtured and developed, in the central state of the people, not in its Diaspora.” For Sutzkever, however, Yiddish literature was very much alive, and the journal he edited for forty-six years opened its pages to literary voices, both old and new, from around the world. Di goldene keyt—its name echoes the title of a play by I. L. Peretz—helped to transform Tel Aviv into the last major publishing center for secular Yiddish books. Other publishing houses that were active there from the 1950s to the 1990s—Hamenora, I. L. Peretz, Israel-Book, and H. Leivik—were sponsored by one or another wing of the Israeli labor movement or (in the case of the H. Leivik-farlag) by the Yiddish writers’ association. These four publishers accounted for hundreds of titles, about half of them published under the Peretz-farlag imprint. Although the ranks of Yiddish writers in Israel were periodically replenished by waves of immigration—from Poland in the 1950s and 1960s and from the Soviet Union in the 1970s and subsequent decades—ultimately the pace of book publishing in Tel Aviv slowed. By 1995, even the flagship Di goldene keyt could no longer continue. Its demise, with issue number 141, was unheralded, and its editor, Avrom Sutzkever, made no valedictory announcements. Zachary M. Baker is assistant university librarian for collection development in the humanities and social sciences and the Reinhard Family Curator of Judaica and Hebraica Collections at the Stanford Universities Libraries. Previously, he was head librarian of the YIVO Institute for Jewish Research in New York.